This edited article  by Giang Nguyễn is from Loa, an independent news website and podcast that broadcasts stories about Vietnam. It is republished by Global Voices as part of a content-sharing agreement. On July 12, the United Nation’s Permanent Court of Arbitration ruled  that Beijing’s claims to the South China Sea have no grounds. This is the area China has delineated by a nine-dash line across much of the South China Sea. If you’ve seen it on a map, it looks like the letter “U” or a tongue sticking out from the southern border of mainland China and that’s what the Vietnamese call it: lưỡi bò, cow’s tongue. China and the Philippines had been locked in a heated standoff over rich fishing grounds at the Scarborough Shoal, a chain of reefs and islands in the South China Sea. The Philippines finally got fed up and, in January of 2013, it filed suit to the Permanent Court of Arbitration to challenge China’s aggressive territorial claims. The legal basis for this ruling is rooted in a set of laws known by its acronym: UNCLOS, short for the United Nations Convention on the Law of the Seas. China, the Philippines (and Vietnam) are all signatories to this body of law, which is designed to settle disputes. The first take-away is that China’s claims  of historic rights over the U-shaped area have no merit. When China signed on to UNCLOS, it relinquished any historic rights. The second takeaway is that man-made islands do not merit an exclusive economic zone. In several instances, Beijing has tried to stake their claim by turning  rocks and reefs into islands. That is, literally piling sand onto reefs and building ports and military installations on top. UNCLOS — and the tribunal — however do not rule over who has sovereignty. How did people in Vietnam react? 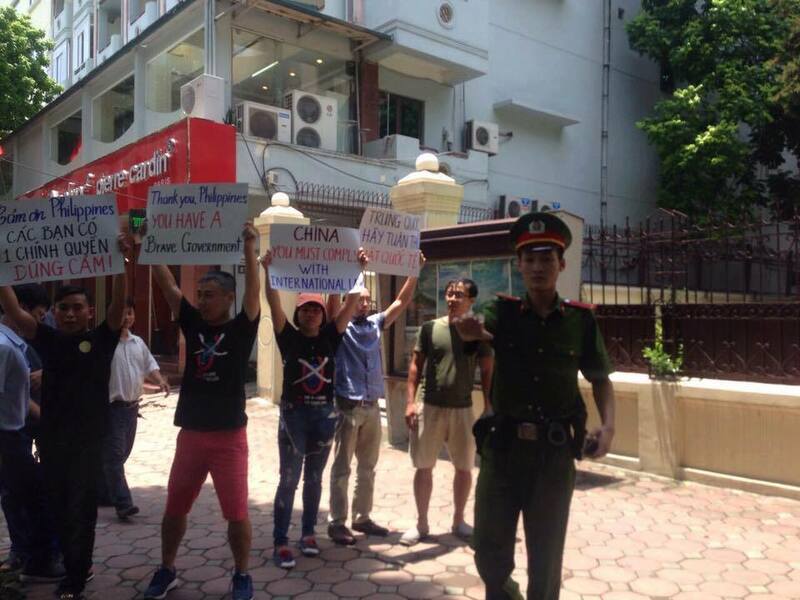 In Hanoi, activists under the “No-U” campaign called on Vietnamese citizens to come out to the Lake of the Returned Sword to show their support for the PCA. On Sunday, July 17, a lot of people wore the No-U shirt. We were overjoyed to wear it because for the past five years, the Hanoi communist regime has painted people like us as subversive elements. So now that we have this PCA ruling, we’re so happy, because this judgement is recognized by the international community. The government sent security police from the districts and wards to walk and circle the meeting point. Anyone who wore a No-U shirt, they called for security forces with cars to sweep them up. It didn’t matter if a person who wore the No-U shirt was doing something wrong or not. They put them all on the trucks. Now that Manila has laid the groundwork, many Vietnamese civil society organizations are calling  for the government to strengthen its position and bring its own case against China, and to vigorously protect Vietnamese fishermen who have faced harassment at sea. But experts say that is unlikely, given Hanoi’s past reluctance to antagonize its communist neighbor. Hanoi is unlikely  to match its people’s forceful assertions. Mindful of the economic and political support it derives from Beijing, Hanoi will probably resolve to just issuing measured statements.